The fact that carbon dioxide is a 'greenhouse gas' - a gas that prevents a certain amount of heat radiation escaping back to space and thus maintains a generally warm climate on Earth, goes back to an idea that was first conceived, though not specifically with respect to CO2, nearly 200 years ago. The three-part tale of how this important physical property, its role in the geological past and understanding how it may affect our future, covers about two centuries of enquiry, discovery, innovation and problem-solving. This is Part One of this series, which also includes Part Two and Part Three. To pick up the scientific trail of what is today known as the Greenhouse Effect, we need to travel back in time to France in the 1820s. Napoleon, defeated at the Battle of Waterloo just a few years previously, had just died, but somebody who had at one time undertaken significant engineering and academic projects for the late Emperor was now busily engaged on his investigations of the physical world, with a specific interest in the behaviour of heat. This was Jean Baptiste Joseph Fourier (1768–1830). Fourier had calculated that a planetary object the size of Earth should, quite simply, not be as warm as it is at its distance from the Sun. Therefore, he reasoned, there must be something else apart from incoming solar radiation, some other factor that keeps the planet warmer. One suggestion he came up with was that the energy coming in from the sun in the form of visible and ultra-violet light (known back then as "luminous heat") was easily able to pass through Earth's atmosphere and heat up the planet's surface, but that the "non-luminous heat" (now known as infra-red radiation) then emitted by the Earth's surface could not make it back in the opposite direction quite so readily. The warmed air must, he reasoned, act as some kind of insulating blanket. That was about as far as he got with the idea back then, as the detailed measurements required to explore this hypothesis were not available, given the technology of the day. Some 40 years later, the thread was picked up again. To Victorian natural historian and pioneer in Alpine climbing, John Tyndall (1820-1893), the evidence, controversial at the time but now mainstream, clearly indicated that at one time much of northern Europe had been covered by ice-caps. However, what was far from clear was how the climate could change in such a drastic manner. Among the possibilities Tyndall considered was variations in the composition of the atmosphere, and via a series of experiments he made the discovery that water-vapour was an important heat-trapping agent. He also found that carbon dioxide was very good at trapping heat, despite being a trace gas occurring in the hundreds of parts per million (ppm) range. Hundreds of parts per million may not sound like a lot, but some compounds have important properties at such concentrations: for example, 500ppm of hydrogen sulphide in air may lead to asphyxia, as any health and safety fact-sheet on the gas will tell you. 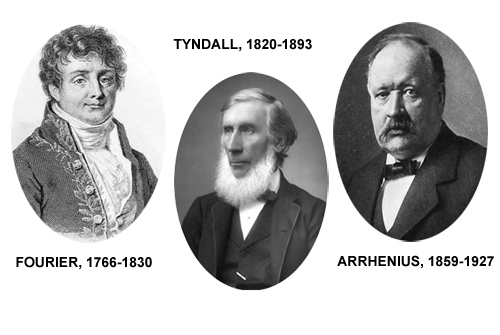 Tyndall's interesting discovery did not completely solve the ice-ages riddle: that came much later. But it planted the seed of an idea that was revisited towards the end of the 19th Century by Swedish scientist Svante Arrhenius (1859-1927). Reasoning that, because it fluctuated daily, water vapour was continually recycling itself in and out of the atmosphere, he turned his attention to carbon dioxide, a gas resident for a long time in the atmosphere whose concentration was only (at that time) dramatically changed by major sources such as volcanoes or major drawdowns such as unusual and massive episodes of mineral weathering or the evolution of photosynthetic plants: events that occur on very long, geological timescales. Arrhenius figured out that an increase in the amount of carbon dioxide in the atmosphere would result in a certain amount of warming. In addition, it was already known via the Clausius-Clapeyron relation, that warmer air can hold more water vapour: the amount is about 7% more per degree Celsius of warming. And that additional water vapour would in turn cause further warming - this being a positive feedback, in which carbon dioxide acts as a direct regulator of temperature, and is then joined in that role by more water vapour as temperatures increase. Through further work Arrhenius determined that if you halved the amount of atmospheric carbon dioxide, the temperature of Europe could drop by as much as 4-5°C. But could such a change, big enough to cause an ice-age, occur? He turned to colleague Arvid Hogbom (1857-1940), who had been investigating natural carbon dioxide cycles, to see if it could. Hogbom had, at the time, started to consider carbon dioxide emissions from factories (simple enough if you know, for example, how many tons of coal each factory burns a year). He had been surprised to find that man-made emission rates were very similar to those occurring in nature. Back in the 1890s, that of course represented a tiny fraction of the fossil fuels that we burn today; but what, they asked themselves, might happen if mankind burnt ever-increasing amounts over many centuries? Side-tracking from the ice-age research, Arrhenius ran calculations to see what a doubling of carbon dioxide levels might do to temperatures. He came up with an answer of 5-6°C of warming as a globally-averaged figure. Back then, at 1890s burning-rates, they didn't see this as a problem: firstly at those rates it would take thousands of years for the doubling to take place and secondly the oceans were thought to be able to absorb five-sixths of the emissions. By the time the hypothesis appeared in a popular book that was published in 1908, the burning-rate had already gone up significantly, so in accordance with that change they revised the doubling-time down to a few centuries, but it was still something of a scientific curiosity, the stuff of after-dinner conversations. The findings did meet with a lot of skepticism during the early 20th Century: the objections were centered around claims of oversimplification, failure to factor in changes in cloudiness, and results of laboratory tests by another Swede, Knut Ångström (1857-1910). Ångström instructed a laboratory assistant to measure the passage of infra-red radiation through a tube filled with carbon dioxide. The tests began with slightly lower amounts of the gas than would be found in a complete section of the atmosphere from top to bottom - although to truly represent the atmosphere, a 250 cm tube, as opposed to the 30 cm one that was used, would have been closer to the mark. Then, the amount of carbon dioxide was reduced by a third: they found what they regarded as very little change and came to the conclusion that the absorption bands of the light spectrum at which carbon dioxide absorbs were quickly saturated - clogged-up, so that their absorption would not increase. Another problem raised at the time was that water vapor also absorbs infra-red radiation, and in the available and by modern standards rather low-resolution spectrographs of the time, the absorption bands of the two gases overlapped one another. It was thought, therefore, that increasing carbon dioxide would be countered by it being unable to absorb infra-red radiation in bands of the spectrum that the much more abundant water vapor was already blocking. However, the precision of the measurements obtained by Ångström has since been shown to have been poor: his reported decrease of absorption accompanying a 33% decrease in carbon dioxide concentration was 0.4%, when it would in reality be about 1%, enough to make a significant change to planetary temperatures. Not only that, total saturation in the lower atmosphere is not a problem for the Greenhouse Effect: if the upper layers of the atmosphere remain unsaturated, they will still prevent heat getting out into space. The atmosphere cannot simply be treated as a tube full of gas: it has multiple layers, each with its own properties, and how these layers interact is important. But back then, it was concluded that Arrhenius was wrong and Ångström moved onto other research, despite Arrhenius publishing a paper critical of the experiments and explaining how in the dry upper atmospheric layers, the role of water vapour was of limited importance. This was - and still is - because water vapor in the upper troposphere occurs in concentrations several orders of magnitude less than in the lower troposphere where most of our weather occurs. As luck would have it, however, nobody took a lot of notice of that and, in effect, the carbon dioxide greenhouse effect hypothesis went to sleep for over two decades. In Part Two, we shall see what happened after the thread was picked up again, in 1931. Spencer Weart's The Discovery of Global Warming gives a very detailed account of the history of climate science with a plethora of references - there are many days' worth of in-depth study there for those who want to go beyond the blogosphere!